Licensing comics from a fictional work can be a gamble. Some wind up expanding and enhancing the lore of the world from whence the source material originated. A great example of that would be the old Star Wars comics from Marvel in the 1970s, where guys like Roy Thomas and Walter Simonson tried to make an ongoing comic out of 2 hours of movie and a few rough designs. Other times, you get a lazy conversion and straight adaptation of the script into a comic like pretty much every other movie comic made by Marvel Comics between 1970 and 1990. 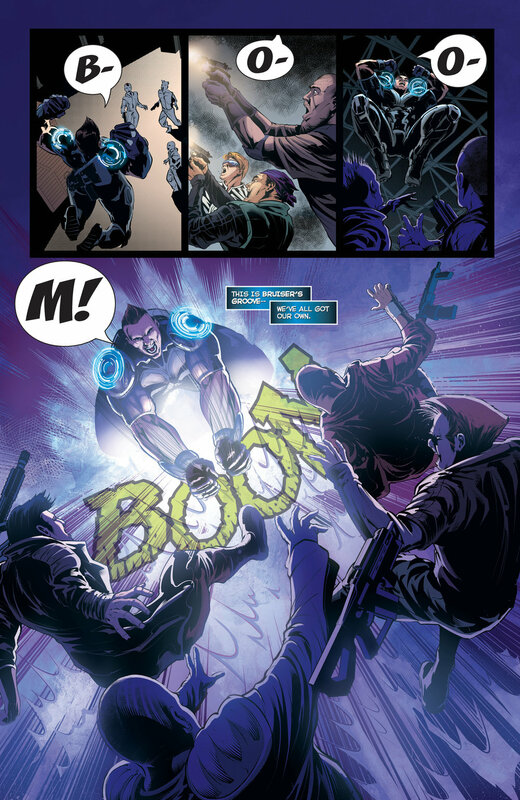 Then you have something that lands in the middle, like Crackdown #1. Based on the recently-released Xbox One game Crackdown 3, the comic Crackdown features writing from Jonathan Goff. With him are interior artist Ricardo Jaime, and colorist Natalia Marques. Goff himself takes double-duty as the letterer for the comic as well. Working from the framework of the video game, the story follows five Agents working with the police force of the city of San Reno in the distant future. Narrating the events of the book is Sub-Commander Rollins, who leads an elite squad known only as The Agents. In what would likely be a tutorial mission, Rollins and hew crew take out a team of fanatics known as the Xero Lux, but life seems to have other plans. The writing honestly feels scattershot in places. The narration is solid, and Jonathan Goff is undoubtedly trying to make what could be a bland comic stand out with both purple prose and flowery text. However, the script alone earns this book it's “Teen” rating from Dynamite, and it feels ultimately like a kid trying their best to prove they’re an adult by using swear words. The use of random catchphrases that sound like they’re from the game also doesn’t help, but it certainly gives the comic an injection of attitude. The whole thing feels like a comic right out of the so-called Dark Age of Comics, complete with tons of guns, tons of badass slogans, and over-the-top one-liners amongst the carnage. There’s a real charm to it, but it feels a lot like a generic summer action blockbuster movie: all flash, little substance. Goff dashes word balloons with tons of colors and fonts; he is undoubtedly having a blast with the lettering. Once more, it feels like a blast from the past. While the comic feels scattershot with the script, the art is spectacular. Ricardo Jaime’s pencils and inks are incredibly detailed, and with a fair amount of variety in both the goons and the five main characters. Rather than just slapping generic armor on everyone, Jamie tries to give each of The Agents a unique take on the same equipment, with different body builds for each character further making everyone different. It still feels like something out of the 90s like the script does, but with a shiny new polish and a lack of pouches. 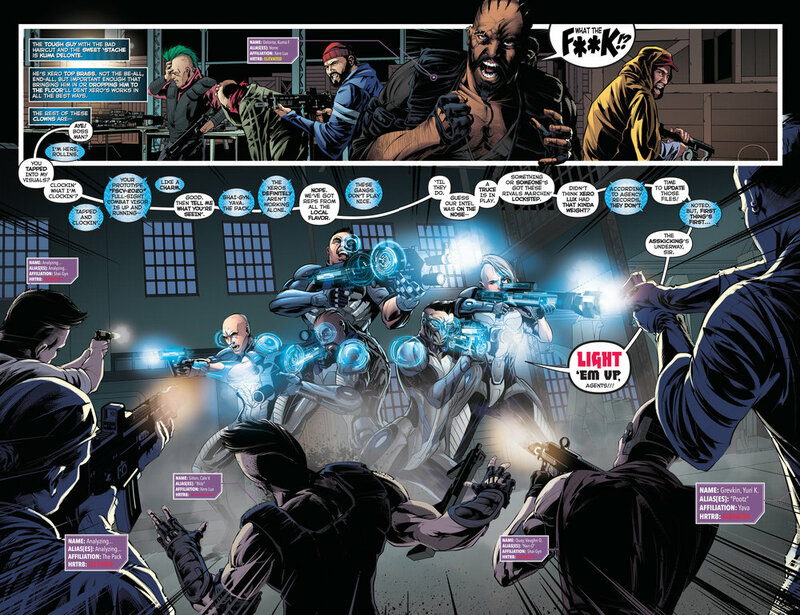 Natalia Marques’ colors help bring Crackdown #1 out of the 90s and further into the modern age. The technological flair and neon colors are incredible and make the comic feel like the future. In all, there’s a real attempt to craft something out of a create-a-character open world game, and that’s commendable. However, the result feels incredibly generic and seems to be struggling in finding an identity of its own. It’s not a bad comic, and there are much worse comics out there by talent not even trying. However, this is one of those books that only dedicated Crackdown fans should be grabbing.